I have finally got into the mode that I need to be in for my dissertation. Up until last weekend I just didn’t care, I went in for a meeting on Friday with my dissertation supervisor to discuss how I was getting on. No surprise that she was a little disappointed that I had little done so far but that doesn’t really bother me, I am not the only one that has not done too much. But yesterday (Sunday) I finally began to take it seriously, I looked up a lot on the topic which I writing about, it is on cloud computing for home use, I am not sure if I mentioned it before. Motivation is a thing that I struggle most with when doing any sort of college work, not just with this dissertation. But I know this dissertation is important and I need to get it out of the way. I have another meeting this Friday, pretty sure it will be every Friday from now on, again this meeting will be to discuss my progress, this time I intend on having a fair chunk of my dissertation done, by that I mean at least a full chapter. It seems like it is feasible. I am constantly thinking of a few new things I can add into my dissertation here and there, but I cant add them in just yet because I haven’t reached that point / chapter of the dissertation. I have points written in a separate word document to my dissertation, these are for use later and only if I think they will fit. As I continue with my dissertation I will no doubt begin to write a few blog posts about it, it will serve two purposes. The first is it will be a sort of journal or proof to myself that I am doing work and the second is that hopefully someone will find it interesting. A fellow classmate said that her supervisor suggested keeping a journal in blog style, which I think is a great idea! I’m meant for this post to be up sooner, but better late then never I suppose! Last Friday our results for the exams that we sat just before Christmas were released. The results are not supposed to be officially released until 5pm when the college will send out an email with login details for you to go to a site and get your results. From previous years I have noticed that if you can remember your login details from previous semester results then you can go straight to the results website earlier in the day, usually sometime around 2pm and you can log in early. That way you get your results early and don’t have to wait if the college site crashes and you cant access your email. If you get an access denied message, just try again every 10 minutes or so, eventually they will be up. Now onto my results, the good new is I passed everything! I am absolutely delighted about it, I didn’t get exactly what I expected, they seemed to be marked harder than I thought, I wasn’t alone, others in my class felt the same, but overall I am happy. The last thing I wanted to have to do is repeat an exam from Christmas during the summer, it’s a nightmare. That’s the way our college does things, instead of the logical way of making the re-sit in January, they decided to add it in with all of our summer exams! Ever try and remember stuff for an exam about 8 months after doing it? So now that I have my results, I am more at ease that I wont have a repeat hanging over my head, now I can focus on everything I have to do this semester. I am really looking forward to these final exams in summer, more so looking forward to finishing college and getting started on a career, college is getting boring now and all I keep thinking is, get the work done and get out. Two weeks ago i bought my MacBook Pro, once it was delivered i decided i would have to buy a case for it before i attempt to bring it out anywhere apart from my house. I looked around online at a few cases for the 13″ MacBook Pro and found a lot of cases but once i read the reviews people were saying that a certain case had to be bought for a MacBook Pro since it is a different shape than a regular Notebook ( i assume it is the thickness ). I wasn’t sure whether this was true that a certain case had to be bought, but i didn’t want to take the risk buying a case and then having to go out and buy another because it wasn’t the right type. 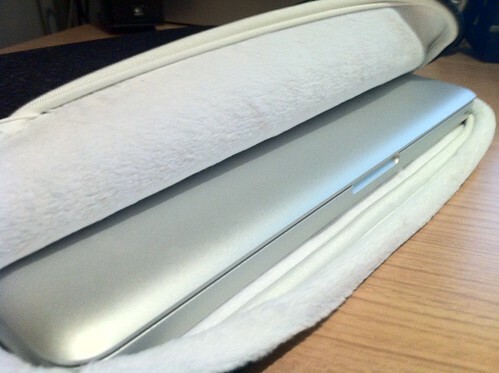 So last week i ended up going onto the apple website and having a look at their cases, they are all really expensive, and i just wanted a sleeve, something which would protect the MacBook while it is in my bag. I went for a mid-range priced case, it came to just under €40 ( €39.95 to be exact! ), fairly steep for a case, but the way i think of it is, i spent over €1,000 on the MacBook, why buy a cheap case! 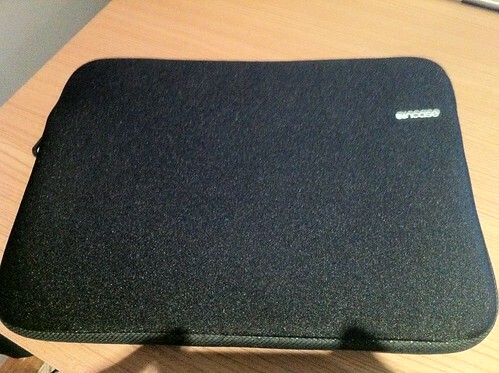 The case i went for is black, and has a really soft inside, it is like cotton wool! The last case which i bought which was for my Netbook was a very poor quality material, it was the same inside as it was on the outside. You can also get the case in a few other colours and sizes so you don’t have to just go for black, like me. I just like to have everything matching and since everything else i own such as my TV and computer are black, i thought i might as well make the case match too. 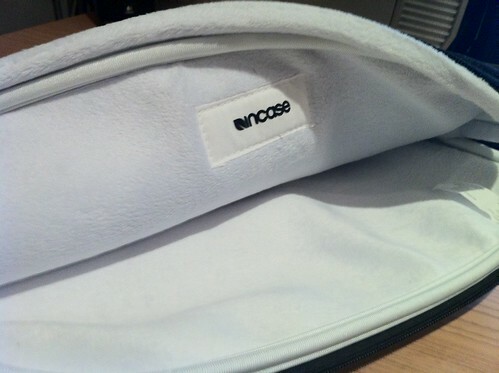 The case i bought is called: Incase 13″ Neoprene Sleeve Plus for Macbook Pro you can get it from the apple website. I think if you are looking for a good case which will protect your MacBook Pro 13″ then this is perfect. I took a few pictures of the case, you can see them below. Car insurance has to be the most dreaded thing to pay every year, at least for me it is. Since I am only driving a few years it still costs me a absolute fortune, not as much as it used to be but still a large enough sum. Every other year up until now I have just taken out a loan and then went straight to the bank and transferred the money into my insurance company, it is so painful having to do that as I don’t get a cent from it! So each year when I pay it off I am delighted to be debt free, and I have decided that this year I am going to change the way I pay for my insurance. Usually I would put some of my own money towards the insurance along with the loan. However, this year I am just going to save for it in full. It will be great this summer to not have a loan hanging over my head, that way, anything I earn from work will go straight to me and I will not feel like I am only working to pay off my loan. The plan at the moment is to save as much as possible, if I can save €100 a week it would be ideal and I should have all the money saved within 5 weeks for the loan. I have already being saving over the past few weeks, but only a bit here and there, the aim for the moment is to just throw all the money into the account and forget about it. 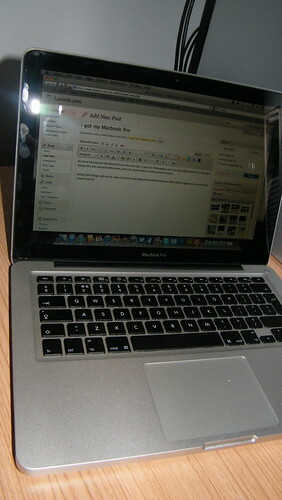 So i have had my new MacBook Pro now for a few days now ( i got it on Wednesday ) and i am still getting used to it. I never got to try out a mac properly before now, just a few quick looks in various stores in town. Doing little things such as cut, copy and paste using keyboard shortcuts took me a little while to figure out, now of course i know how to. Also something i think is a bit strange, there is no hash key (#) anywhere on the keyboard, for this i had to look it up on google, i then found out holding the alt key and pressing 3 will bring up the symbol, it is a very important key especially when writing CSS! I am surprised that the key is nowhere on the keyboard, i never used a keyboard that didn’t have it somewhere, i am not sure if it is just on the MacBook Pro’s or if it is the same for all Mac Machines. My first impressions of this MacBook is that it just looks great, you when you see those cheesy mac videos where they talk about there new product, overselling it, well some of that stuff is actually true! The screen is amazing quality, it is a glossy screen, some find them annoying but i think they look great, the colours really stand out with them. Another thing that i find great on this MacBook pro is the speakers, they are excellent, really loud and clear just what you want. All of my previous laptops had really poor speakers in comparison. Onto the keyboard itself, it has lots of new features compared to the standard computer keyboard, these new features include quick links to your widgets on the mac which show the weather, time etc and another key which allows you to see all of your currently open windows spread out nicely so you can simply pick one. 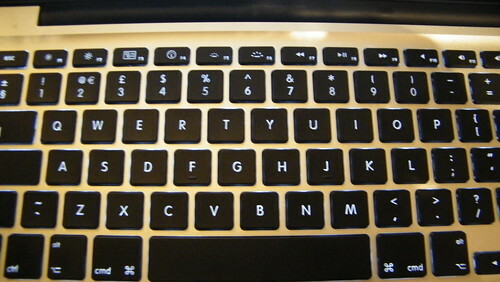 The keyboard is really nice to type on, really soft touch keys which are backlit in dark conditions! I was messing with this feature, if you shine a light at the camera on the MacBook then the keys will go out ( providing you are in a dark room) then if you take the light away it illuminates again, it is great if you are lying in bed with the light out! The mouse is something different for sure, it is massive and is one giant clickable multi gesture trackpad. To right click you simply click touch and press the pad with two fingers, you can also scroll up and down pages by just dragging two fingers either up or down to move the page, the same apply for zooming, pinch in or out, it works essentially like how you would use the iPhone. 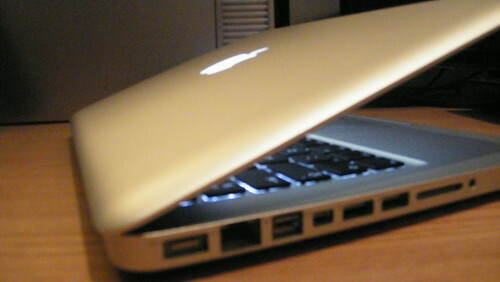 Other features included in this MacBook Pro are a built in camera with microphone, 13″ glossy screen, 4GB of ram and a 2.4 GHZ Intel Core 2 Duo Processor. The machine is lightning fast, it starts up within a few seconds and shuts down in about 4 seconds, no joking! So it is a really nice bit of high tech equipment, i could have waited until later this year when apple will be releasing there new line of computers, but instead just bought one now, this has everything i want and more. As i begin to use it more i will throw up a few of the apps that i am using! 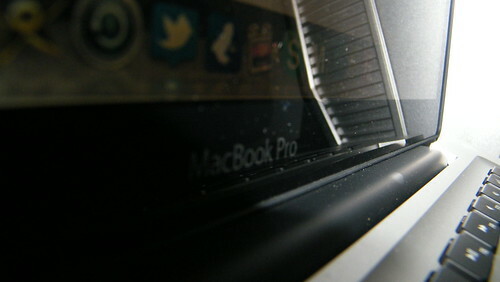 There is also a few more photos of my MacBook in my flickr-stream if you are interested. p.s: if there are many spelling mistakes over the next few days on my posts, take it easy 🙂 i have yet to install Microsoft office on my macbook, which i use to spellcheck my posts, so it is likely i will miss a few misspellings!